Congratulations to the Flea Market for being chosen by both The Tennessee Magazine and Busy Bee Trader as the bestflea market in Tennessee. The Tennessee State Fairgrounds Flea Market is considered to be among the top ten flea markets in the country. Dealers and vendors from 30 states offer their wares to the buying public. Eager shoppers travel hundreds of miles, often by the bus load, to peruse the bargains and hard-to-find items offered for sale. You'll find a huge variety of gifts, antiques, collectibles, jewelry, arts and crafts, tools, house wares, handmade clothing, and hundreds of thousands of other items each month. Shopping.com is a price comparison service. Shopping.com used to be called DealTime.com. It was founded in Israel in 1998 by Dr. Nahum Sharfman and Amir Ashkenazi, whose original idea was to create a downloadable client that would monitor changes in prices of products the user seeks to buy over time, notifying the user when the product price reached a predetermined level (hence the site's original name, DealTime). Originally targeting American consumers, the basic concept was quickly modified from a downloadable client to a purely web-based service, a concept the company has kept ever since. I had the privilege this weekend of visiting several shops in the Hendersonville Area. I was so impressed with their uniqueness that I felt compelled to share with you my findings. We are so lucky to have such great places to shop in the Hendersonville Area. There is no need to go to the malls or fight the mall traffic to get a one of kind shopping experience. As I discovered this weekend, we have several jewels right here in Sumner County that you can do all of your shopping even for the most hard to buy for person. The first place I wanted to share with you is Over the Top. It is located at 336 W.Main Street in Hendersonville. I walked in to a room filled with the most precious and most unique items. Words can not even begin to describe the adorable baby and kids section of the shop. They have so many wonderful items for children. If you are in the market for a one of a kind baby shower gift, this is the place to go. I promise you that you will not have to worry about the mother to be receiving two of your gift. I could have spent hours in this store relishing over all the interesting items that they offer. It was truly a great shopping experience for me. The second place that I wanted to share with you was Floors and More located at 709 W Main Street in the Old Hunts Building in Hendersonville. WOW! This is woman’s paradise. They offer a wide range of products from purses to home décor. I could have spent hours inside this store as well. I could not even take everything in because they offer so many items. They offer VERY reasonable priced items. This is a place that I would recommend if you are in the market for a gift for a friend’s birthday. They offer something that every woman would love to have or wear. They have a lot of interesting jewelry along with a great selection of purses at UNBELIEVABLE prices. This is a must shop for all women. The third place that I want to share with you is the Trendy Trunk located at 203 Anderson Lane in Hendersonville. This is close to Heaven for me. I loved every item in this store. They offer unique one of a kind gift items for friends and baby showers. They also have a good variety of purses and interesting little must haves for all women. A couple of my favorite items at this shop was the selection of hand bags, the selection of baby jewelry, the selection of printed facial tissues, and a flip notebook for your purse. They offer so many wonderful items, it is impossible to leave without buying something. I promise you if you walk in, you will walk out with a must have item. This shop is a true favorite of mine! Again, moms of Sumner County, we have a lot of really interesting and unique shops to choose from in the Sumner County area. These shops are definitely our jewels in Sumner County. So get ready, get out and get shopping! Move over New York and LA as the highly-anticipated evolution of style has found a new home and it’s in the South. 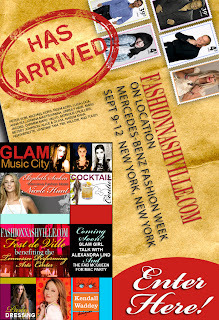 Attention ladies in Nashville, Dallas, Little Rock, Birmingham, Atlanta, New Orleans, Miami, Louisville and major cities in between, it's time to embrace your inner glamour queen!FashionNashville.com is the Southern fashionistas first online guide to gorgeous living, fashion, parties, entertaining, travel, beauty and style. Like your best “in the know” girlfriend, FashionNashville.com is your latest dish on “what’s hot” and “what’s not” as well as giving you an inside peek at event listings for exclusive soirees such as trunk shows, glam luncheons and cocktail parties at Tiffany, Louis Vuitton, Neiman Marcus, Gus Mayer, Jamie, boutique and art openings, luxurious fashion shows and major social events. FashionNashville.com takes you behind the scenes of some of the most buzz-worthy and super-chic events, with online interviews and exclusive video footage of the stylish set. Take part in a glamorous dinner party with a celebrated designer, gaze in the closet of an A-list country music star, or sit on the front row at New York Fashion Week without ever leaving the comforts of your home. Join us in our online journey into a glamorous and modern-day lifestyle. Feel inspired by professional at-home entertaining tips, decorating secrets of top designers and recipes from the jet set crowd. Get an insider’s beauty tips on fall’s must-have lush lashes, flushed red-carpet lipcolors, glowing flawless skin and so much more.Check out FashionNashville.com.Make a statement, smile and mean it... Live out loud!